Ordinationi e statute della ven. Archiconfraternita di Santa Maria della Pieta in Campo Santo delle nationi teutonica, e di Fiandra (1683). This binding, 18th-century mottled calf with gilt decoration, shows the arms of Pierluigi Cardinal Carafa. Carafa (1677-1755) had an active ecclesiastical career after receiving doctorates in Roman and canon law. Before his death, Carafa served as the Cardinal-Bishop of Ostia in Rome, and was active as a patron in the city. The Ordinationi e statute comprise the statutes of a lay confraternity of German and Flemish nationals who provided burials and masses for their compatriots in Rome. 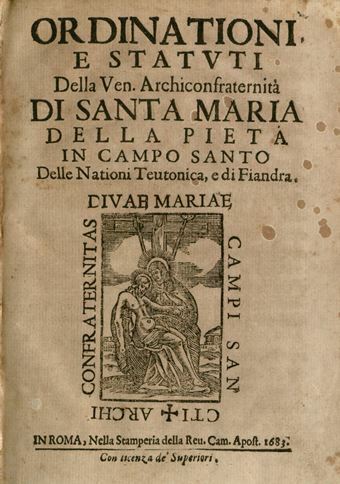 It is the first and only printed edition of the work. “Armorial Bindings,” an exhibit curated by Ryan Greenwood, is on display from September 23 to December 18, 2013, and is located on level L2 of the Lillian Goldman Law Library, Yale Law School. 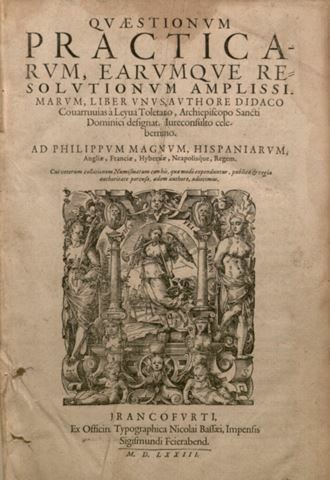 Diego de Covarrubias y Leyva, Qvaestionvm practicarvm (1573), bound with his Variarvm resolvtionvm ivridicarvm (1573). Showing the arms of George Carteret. Diego de Covarrubias (1512-1577), a leading Catholic jurist of the Counter-Reformation, was a professor of canon law, bishop and advisor to Philip II of Spain. His works bound together here treat questions of procedure, based in canon and Roman law. Sir George Carteret (1610-1680) was Comptroller of the Royal Navy before going into exile on the downfall of Charles I. After the Restoration, he became Treasurer of the Navy, and with John Berkeley received (also naming) New Jersey from the future Catholic King James II. Carteret later helped draft a provision for religious freedom in New Jersey. His arms show a squirrel sejant (upright) cracking a nut. Robert Brady, An Introduction to the Old English History (1684), showing the arms of Henry Peter Brougham. Robert Brady (1627?-1700) was a doctor and later professor at Cambridge. A supporter of Charles II, he opposed the Whigs who sought to exclude James, the Duke of York, from the English throne on account of his Catholic religion. In An Introduction to the Old English History, Brady rejected the Whig idea of an English “Ancient Constitution,” and denied that Magna Carta was a document of popular freedom. Henry Brougham (1778-1868), successful as a lawyer and politician, defended Queen Caroline at her trial for adultery. He became Lord Chancellor of England, from 1830-34, and also Baron Brougham and Vaux. As Lord Chancellor, he helped pass the 1832 Reform Bill and the Slavery Abolition Act of 1833. 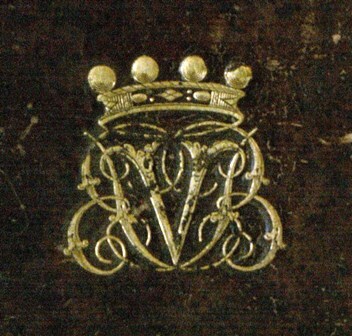 His arms show the monogram B V B, with the coronet of a baron. Magna Charta (1576), with arms of Henry Yelverton. Magna Carta (1215) stands as one of the great legal documents of the western world. Famously, the English King John was forced to accept certain liberties of his subjects and restrain his powers within the law. Although at first renounced, amended versions of it were confirmed and reconfirmed by later kings. This edition, printed by Richard Tottel, was for practising lawyers and judges, and included English statutes in law French and English. 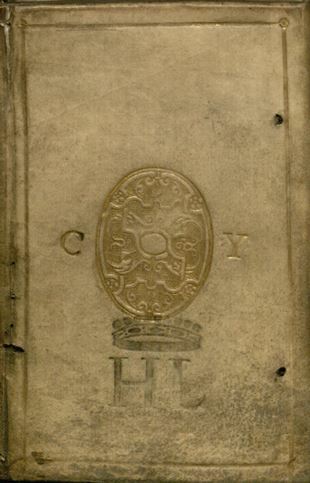 The Law Library’s copy displays the arms of Henry Yelverton (1664-1704), 15th Baron Grey de Ruthyn and Viscount de Longueville. Yelverton’s arms feature a coronet, indicating his status as a viscount. A second stamp perhaps belongs to Sir Christopher Yelverton (1602-1654), Yelverton’s grandfather. Institutiones D. Iustinianei (1664), with arms of Charles William Henry Montagu-Scott. This copy of the Institutes of Justinian, the introductory text of Roman law taught for centuries in continental law classes, was produced by the great Dutch printer Elzevir. The book, in a small and popular format, was likely also a pocket reference for lawyers. Charles William Henry Montagu Douglas Scott (1772-1819) was the Scottish Duke of Buccleuch, and served in Parliament as Baron Tynedale. His arms feature a stag trippant (walking), with the coronet of a duke and a thistle below, indicating the noble Order of the Thistle. 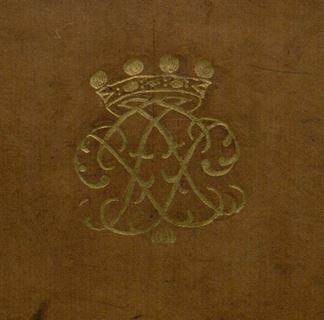 John Fortescue, The Works of Sir John Fortescue, Knight (1869), with the arms of Evelyn Philip Shirley. Fortescue (c. 1394-1480) was a leading jurist and Lord Chief Justice of England and Wales. He is most notable as the author of the De laudibus legum Angliae (“In Praise of the Laws of England”), a treatise which offers a strong defense of medieval English law and government. The Law Library’s copy belonged to Evelyn Philip Shirley (1812-1882), a magistrate, antiquarian and book collector. 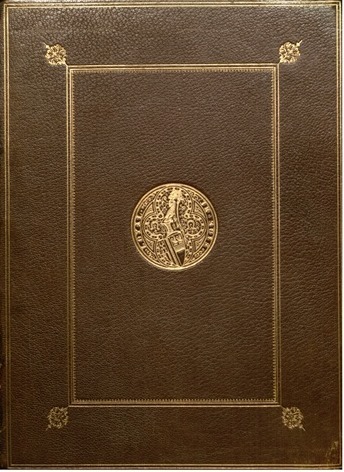 Fortescue’s legacy was promoted by his descendant Thomas Fortescue (1815-1887), who printed this edition of Fortescue’s works, and gave this presentation copy to Shirley with the latter’s arms. The arms feature a “Saracen head” wreathed atop an esquire’s helmet, and two pelicans. The words around the badge read “I am loyal,” in French. John Selden, Table-talk (1689), with arms of John Poulett. Selden (1584-1664), was one of the great English jurists, a polymath and prolific scholar. He treated subjects ranging from English law, to archeology, and was the outstanding English Hebraist of his age. He served in the House of Commons, and was imprisoned for a time in the Tower of London. In an ironic and maybe triumphant twist, Selden was later made keeper of the rolls and records of the Tower. While Selden is remembered most today among legal scholars for his work on international law, Table-talk was a more popular and accessible work. It offers short observations on legal topics, and theological issues like free will, as well as opinions on subjects like friendship. The English aristocrat John Poulett (1663-1743) served in government as First Lord of the Treasury and later was elected a Knight of the Garter. His monogram shows the initials J P beneath the coronet of a baron.